Survive. Solve. Save. Pick one. Note: Mothership is in Alpha, and is actively in development. We make slight alterations and changes between print editions and try to keep the PDF as up to date as possible. We’re hoping for a full final release of the 1st edition in 2020 based on feedback of this alpha. What a great game. What an impressive achievement for a single designer/writer/layout artist/illustrator! I cannot say enough great things about Mothership. The fully developed space station Prospero’s Dream, packed with dozens of locations, NPCs, and tools for running adventures in the city-sized station. Tools for generating your own space station. Rules for customizing your character with cybermods. Tons of brands new weapons, creatures, drugs, and anything else void-faring criminals would want to get their hands on. 48 pages. Two color interior. Written by Donn Stroud, Sean McCoy, and others. Art and Layout by Sean McCoy. Pre-Orders ship after Kickstarter. Tentative ship date June 2019. The Screaming on the Alexis: A one-page adventure on a derelict ship filled with corpses and a strange artifact. A planetcrawl of the Dead Planet with several locations, including The Red Tower, a five-level underground bunker filled with a horde of Gaunt, a terrifying, nightmare-inducing creature. Moon Colony Bloodbath: An exploration of a ritual cannabilistic society trapped on the Dead Planet's moon. Civil war is brewing, and nightmares are driving the colonists to compulsively sculpt nightmarish totems. A generator for making your own derelict ships at the table. Review from Ten Foot Pole. Review from Dungeons & Possums. Review of Dead Planet from The Gauntlet. want to kill your players? If you want to run public games of Mothership in exchange for free swag, then the Mothership Wardens Club is for you. Please feel free to download and print out these character sheets and player aids for your Mothership game. In the future, we'll be looking to add some alternate character sheet for more advanced players as well as some pre-built starships. Let us know what else you'd like to see. 8.5x11" Character sheet. Includes all the instructions for character creation on the page, as well as a Skill Tree flowchart for tracking your character's progress. Class options and starting equipment loadouts included as well. 8.5x11" Ship creation sheet. Includes simple and intuitive instructions for building a starship on the page, as well as room for layout and design. Build a mining frigate, shuttle, hunter, freighter, or troopship. The options are limitless. 8.5x11" Mercenary sheet. Sometimes you need to hire mercenaries to help get the job done. Mercenaries have more limited stats than regular characters. Each sheet holds four "mini" mercenary sheets. 5.5x8.5" Cheat sheet. 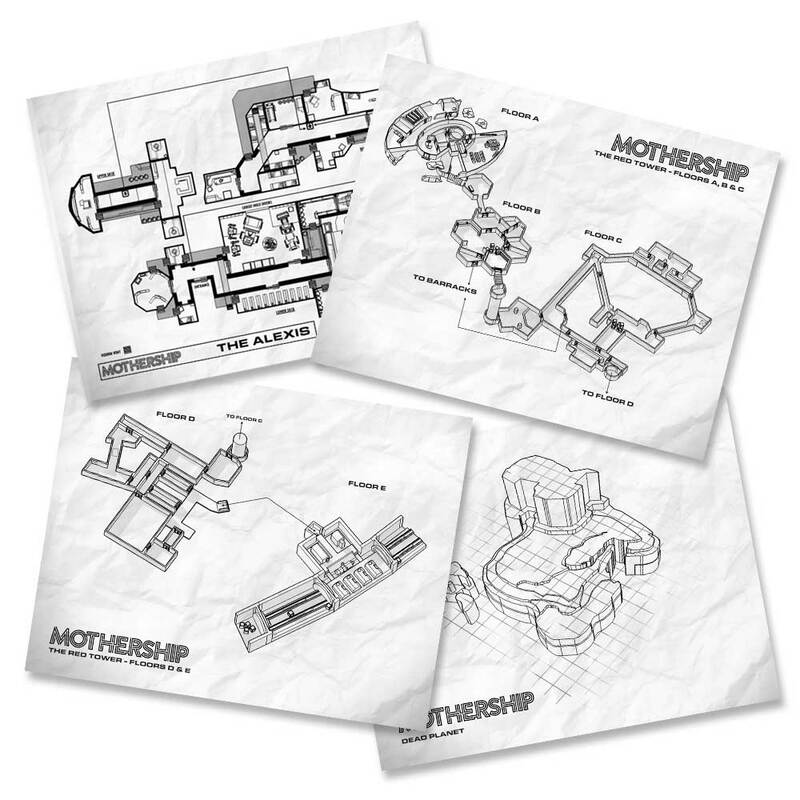 Contains the basic rules and procedures in Mothership, including the basic mechanics, combat, stress & panic rules. Two can fit on a page and make good handouts for new players. 8.5x11" Tables. From the Dead Planet module. Find out what happens when your Jump Drive freaks out. As a bonus, there's d100 Random Weapon Caches, perfect for when the crew stumbles upon some unmarked loot crate. x4 8.5x11" Maps. Highly detailed, printer-friendly maps of The Red Tower, The Alexis, and a map of the Dead Island from the Dead Planet. Perfect as handouts for players or for Wardens hacking their own unique missions. 8.5x11" Table. This sheet contains tables to determine where your player’s Androids were manufactured and for what purpose, as well as a custom Android Panic Table for those extra-special freakouts. Have a question? Want to find a playgroup? Check out our Discord channel where the devs and playtesters hang. You can join the Mothership Subreddit r/mothershiprpg and find resources and post links to help your fellow Wardens! Also, you can find Mothership on RPGgeek for further discussion.